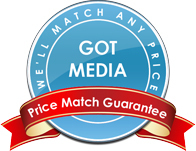 GotMedia sells a complete line of Thermal Printable C-R Media in Orange County, CA. There are 2 things to consider when choosing a thermal printable CD-R surface. White thermal media is the most popular for most common printing jobs; such as photographic printing. Silver Thermal Printable CD-R Media offers a metallic background. 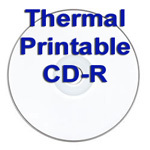 Most CD DVD Thermal Printers can print on various surfaces including thermal hub printable C-R media. If you would like assistance in choosing the right thermal printable CD-R Media product for your needs, don't hesitate to call one of our knowledgeable representatives at 1-866-409-1090. Titan Media is proud to present a new line of the most affordable White Thermal Hub Printable, Metalized Hub CD-R in the market right now. Titan 52X CD-R have high-resolution White Thermal Hub Printable, Metalized Hub. They also serve as a cost saving alternative when compared to thermal printing.